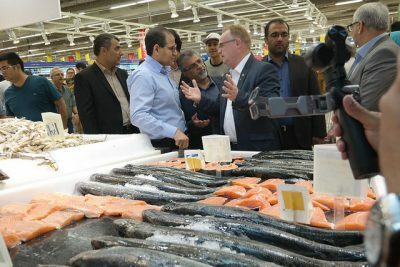 Fisheries Minister Per Sandberg claims his summer holiday in Iran this month was strictly private, but it’s been raising plenty of very public questions. That’s because Sandberg, from the anti-immigration Progress Party that wants to restrict refugee arrivals in Norway, traveled to the controversial country with a woman who came to Norway as an asylum seeker and now runs a firm aimed at boosting seafood trade between Norway and Iran. 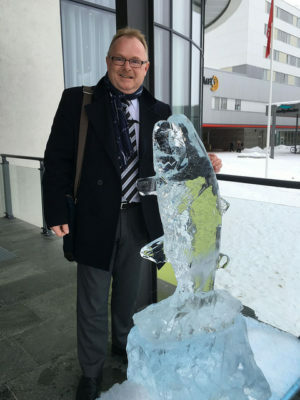 That in turn has raised questions of conflicts of interest, since Sandberg himself is Norway’s top official promoter of Norwegian seafood exports. Media outlets wonder whether the firm run by the 28-year-old Bahareh Letnes, who was granted asylum in Norway only after Iran rejected Norway’s effort to deport her, may receive any special access or advantages, since Sandberg works so closely with Norwegian seafood exports. Opposition politicians in Parliament are also questioning whether it was appropriate for the recently separated, 58-year-old Norwegian government minister to travel to Iran on holiday, given all the debate over the Iran Nuclear Agreement, charges of human rights violations in Iran and its role in hostilities in the Middle East. Even high-profile members of Sandberg’s own party have been questioning why Sandberg has been spending a lot of time on and in Iran. He traveled in his role as fisheries minister to Iran in 2016, in an effort to boost exports of Norwegian salmon to Iran. Last March he took part in a celebration of the Persian New Year at the Iranian Embassy in Oslo, along with Letnes. Sandberg dismisses all the questions and criticism. “It wasn’t the fisheries minister or the deputy leader of the Progress Party who was on holiday in Iran,” Sandberg insisted on state broadcaster NRK’s national news program Dagsnytt 18 just after landing back in Oslo on Monday. “It was the private person Per Sandberg.” He claims earlier summer holiday plans were disrupted, so he and Letnes simply decided at the last minute to travel to Iran instead. Letnes then proceeded to publish photos of their holiday tour together, while visiting restaurants, shopping and sightseeing, on social media. That sparked the interest of newspapers VG and Dagens Næringsliv (DN) and newssite Filter Nyheter, among other media. Others argue that government ministers have to sacrifice much of the private lives while in government service. Sandberg thinks he should be allowed to separate his private life from his professional life. DN, however, reported this week that Iranian authorities asked for a meeting with Sandberg while he was in their country. Sandberg confirmed the report, but said he turned down the request. “They were told that I was there on a private visit, and didn’t want to meet with people in power this time,” Sandberg said on NRK’s live radio program. Opposition politicians are not convinced and vow to take the question of Sandberg’s habilitet (whether he’s qualified to determine his own impartiality) to Parliament. Sandberg claimed he’ll be ready to defend himself. Sandberg’s relationship with Letnes, who won the title of “Miss Iran” in 2013, has also raised questions given Sandberg’s and his party’s calls to restrict immigration and granting asylum in Norway. Letnes came to Norway as a teenager but her application for asylum was rejected in three instances and she was forcibly returned to Iran. Iranian authorities, however, sent her back to Norway and she finally was granted residence in Norway in 2008 on the grounds she was young and could risk forced marriage in her homeland. Sandberg’s own conservative government tightened regulations just three years ago that now call for revocation of residence permission if asylum seekers travel back to their homelands on holiday. Sandberg claimed Letnes is not covered by the new rules, since she has become a Norwegian citizen. He called questions about her refugee status “ridiculous,” apparently seeing no conflict or hypocrisy regarding his politics and her case at all. Others do, and for other reasons. “Iran is one of the worst countries in terms of violations of human rights,” Mahmood Amiry-Moghaddam, a professor at the University of Oslo and leader of Iran Human Rights, told NRK on Tuesday. “In July alone the regime executed more than 30 people. Therefore it’s problematic for Sandberg to travel to Iran, even as a private person.” He thinks Sandberg is legitimizing the Iranian government. Still others worry that Sandberg’s private travels in Iran can pose a security risk, and that his recent actions seem to be at odds with the Progress Party’s own skepticism towards Iran. Many top Progress Party officials are also highly critical of Islam and have much more sympathy for Israel, which views Iran as an enemy. Sandberg responds that he simply viewed the lifting of sanctions against Iran as providing a new opportunity for Norwegian salmon exports. If those sanctions are imposed again, which is something the US is already demanding, both Sandberg’s and Letnes’ trade hopes may be dashed.